PTMSC Blog : What's New at the Marine Science Center? Hi there guys and gals! It's been a while since we've posted on the blog- partly because we wanted to let Chris' thoughts on "poop" really sink in- and partly because we've been so busy with all the transitions around here. So what kind of transitions are we talking about? And who is "we"? Well, "we" is the new AmeriCorps team for the 2011-2012 season! Jamie Landry comes to us from her hometown of Gilford, NH. After graduating from the University of Rochester, she moved to Iceland in 2009 to pursue her Master's Degree in Coastal and Marine Natural Resources. After spending an additional year in Iceland as a head volleyball coach, she moved back to the US to work as a naturalist and environmental educator with the Adirondack Mountain Club outside Lake Placid, NY. Now residing in Uptown Port Townsend, she can be found at PTMSC in the Discovery Lab, around town on her early morning runs, playing volleyball with the local club, or knitting traditional Icelandic sweaters. Elise Gorchels is a very busy, well-caffeinated, scuba diving conservation biologist whose greatest fear in life is being boring, followed closely by being bored. She is a transplant from Madison, WI and can most frequently be heard discussing cheese, microbrews, and Badger football. When she isn't at work she's probably underwater photographing all the great life the PNW has to offer! After graduating from UW Madison in 2008 she spent two seasons as an educator on Orcas Island and one year as an AmeriCorps member at a community center in Madison. Jen Stevens is originally from Minnesota and has a Bachelors Degree in Marine Zoology from The Evergreen State College in Olympia. She spent time doing husbandry and research of sea turtles at Mote Marine Laboratory in Florida and recently worked as a zoological aide at Point Defiance Zoo and Aquarium. Jen’s main objective at PTMSC is the East Jefferson County Marine Mammal Stranding Network and lately has been helping run seal necropsy trainings. When not at PTMSC she can be found exploring downtown, hanging out with her two felines, or playing Dungeons and Dragons with her friends in Olympia. So there you have it! 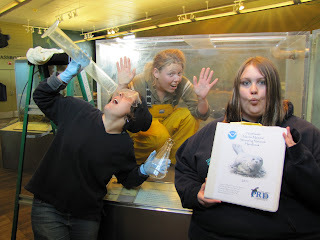 These three vivacious ladies look forward to working with all of our wonderful volunteers and inspiring future Marine Science Center visitors with their enthusiasm and passion for the magnificent Salish Sea. You may have recently seen former PTMSC 2010 Summer/Fall Intern, Claudia Padilla around a bit more than usual. After spending last winter and spring working various jobs around town and traveling, she's back as staff through October 2012. She will serve as the Education and Volunteer Program Organizer to assist with a variety of tasks such as working with the volunteer program, writing education curricula, organizing and planning Free Science Classes, and helping to maintain the NHE among many other responsibilities. Claudia is originally from Pennsylvania where she attained her Journalism degree from Penn State. She served as an AmeriCorps as part of the Maryland Conservation Corps, before moving to Washington, DC in 2006. After a few years in DC at different non-profits, she was ready for career shift, starting with PTMSC in June 2010. Being in the Pacific NW has rekindled her love of the outdoors and educating the public about the environment. Swimming, cooking, exploring the Olympic National Park and reading are some of her favorite things to do. So, stay tuned for more updates and thanks for reading!